We are excited to have Nadine Black teaching our class this Sunday, May 24th, on Attracting Songbirds into the Garden. I caught up with her and asked a few questions about the class. What are a few steps to attract more birds to your yard? Like any living creature, birds need food, water and a safe place to raise their young. What plants do birds love? They like plants that provide food such as Aronia, Cottoneaster, Blueberries,and Coneflowers. 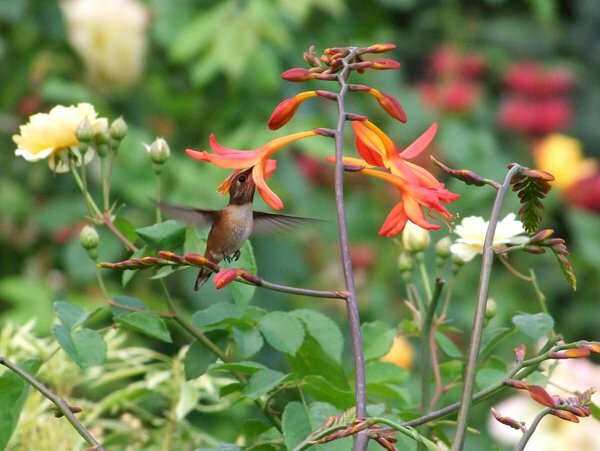 Humming birds love any nectar-heavy plant such as Honeysuckle, Fuchsia, Crocosmia, Penstemon, and Lavender just to mention a few. Are there aspects to attracting birds that often get overlooked? I think there are two things that may not come to mind readily. The first is thicket. There are many song birds that nest on the ground. They need a dense shrub or a pile of debris, preferably with thorns, to provide protection. This leads me into the second item. Being aware of what predators might be in the area is important. Sometimes, the predators can’t be foiled, but we need to try. 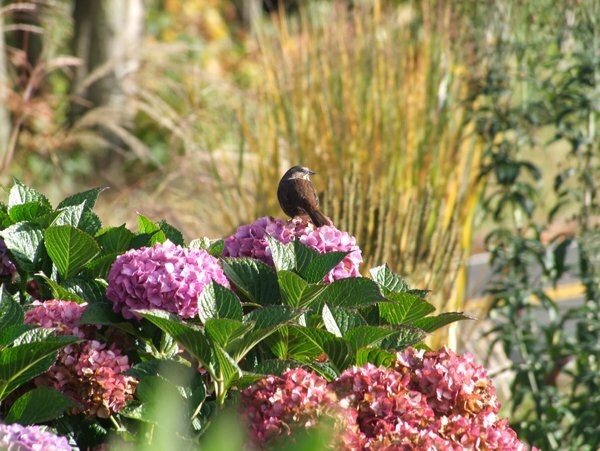 What plant and bird combinations stand out the most to you? 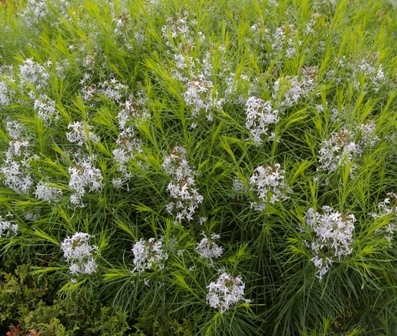 The two that jump out at me are Cottoneasterfranchetti and Robins and Humming birds and Penstemon. The fruit and nectar of these two plants seem irresistible to the respective birds. What birds bring you the most joy in your own yard? I would have to say, the singing Finches and Sparrows. Although I am delighted by the sight of a zipping Humming bird or the dramatic Flicker and I get a big kick out of discovering something new to me like a Ruby Crowned Kinglet, the pleasure of hearing the songs and how they are often answered from afar, is truly joyful. All I have to do is go out on my back porch and listen. I would like to thank Nadine for taking the time to answer these questions and assure you that she will have lots more information in her class. She is a wonderful speaker and I highly recommend all of her talks. We hope to see lots of people this Sunday, May 24, but if you can’t make it we hope this still provided lots of helpful information.